I've heard of this short story as a classic a few times, so I decided to buy the paperback recently. There's seven stories in here, I think, all set in the late 1800s when the book was published. The titular one is the most famous and it concerns a woman who is suffering from nervous exhaustion and who is convalescing in a rented house. 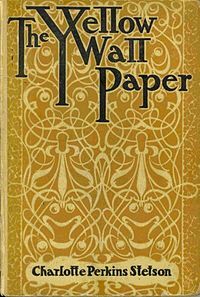 She is certain she can see a woman trapped in the wallpaper and starts to go a little bit crazy as time goes on. I liked the main story but I liked a couple of the others better. They were all about well off people and set against slavery in the deep south, with well-drawn characters and intriguing plots/ I really liked all the stories so give this collection five stars out of five.